Designed for Fine or Abrasive Particulate. The major obstacle to dust collection efficiency is re-entrainment, the refiltering of dust that has been stirred up prior to settling. The goal is to dislodge the dust from the filter and allow it to settle in the hopper. The ATV Series utilizes patented downflow/verticle technology to minimize re-entrainment and extend filter life. Carefully managed inlet air velocity ensures that the air only flows downward, never upward or sideways. 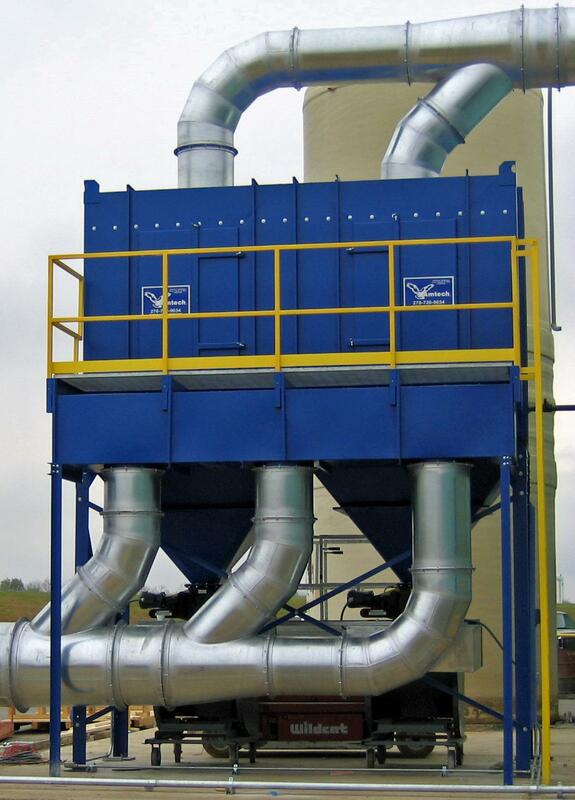 This prevents air movement below the filters where the dust has settled and results in effective cleaning while the dust collector is operating and shut down. 1. This design produces zero velocity at the base of each filter stack, allowing the dust to settle uninhibited below the cartridges, thereby eliminating re-entrainment. 2. The standard 80% cellulose 20% polyester cartridge media is high in resin content to provide mechanical resilience, and has pleat-lock construction. Standard cartridges are rated for temperature up to 160°F High temperature cartridges are also available. 3. This design allows larger dust contaminates to have a clear path to the dust settling area and finer particles to be collected by the filters. 4. Venturi reverse pulse cleaning is the quick release of pressure through a blowtube into a venturi enductor tube into a cartridge filter. A higher volume of air is induced via this principle. The resulting burst of compressed air is more equally dispersed across the filter resulting in greater cleaning effectiveness compared to typical reverse pulse cleaning. 5. Pulse jet performance and economy are maximized by optimizing the orifice size and position. There are four methods of initiating jet pulse cleaning to best fit each application. •	Carbon Steel Welded Construction 7 ga./11 ga.